Getting Students With Autism Through High School, To College And Beyond : NPR Ed Nationwide, students with autism are enrolling in college in relatively low numbers, even compared to students with other disabilities. One program in New York City is trying to change that. Colin Ozeki, a high school student with autism, is on track to graduate this year from Millennium Brooklyn High School with an advanced diploma. 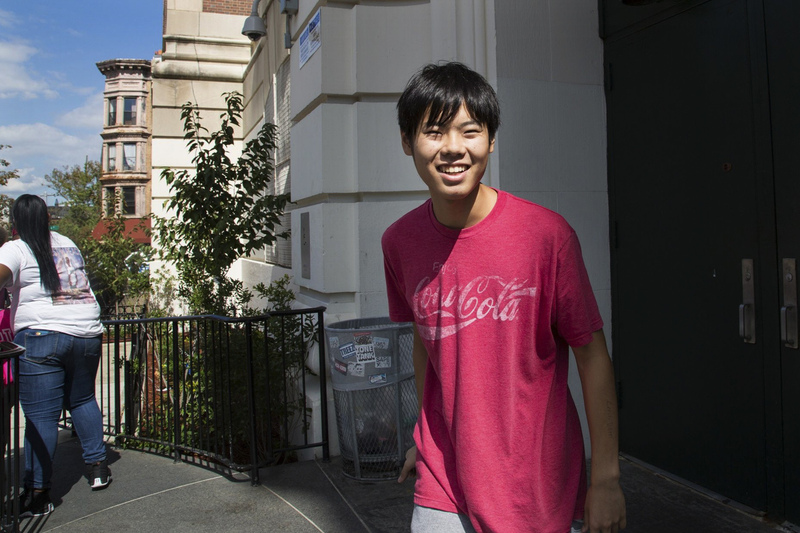 Colin Ozeki, 17, doesn't like to sugarcoat how autism spectrum disorder has affected his interactions with others, his emotions and his own self-confidence. He sees it as an issue to confront, something about himself to work on and improve in order to fully participate in life around him. He appreciates the adage, "It's a difference, not a disability." But he disagrees with it when it comes to himself. "I don't think I would be at this place that I'm at right now if it weren't for people acknowledging the idea that I had some kind of problem per se," says Colin. "I might have just been this confused person forever, and somewhat underdeveloped." We know a lot more about children with autism spectrum disorders than we did just a decade ago, but nationwide students with autism are enrolling in college in relatively low numbers. Colin, now a senior at Millennium Brooklyn High School, has been part of a program in the New York City schools aiming to change that. It's called ASD Nest (ASD refers to students with autism spectrum disorder) and he's been with it his entire school career. A key underlying philosophy of the program is that education — the classroom — provides the most effective treatment for autism. The program, run jointly by the city's Department of Education and NYU Nest Support Project, places students with autism who are capable of doing grade-level work in classrooms with their non-disabled peers. The program came about in 2003 in response to poor academic outcomes among students with autism, including those like Colin, who were academically strong. Very few of these students were graduating high school, attending college and having careers. Nationwide, these numbers are improving, as public schools work to meet students needs and as more colleges create programs to support students with autism. Still, a small minority of these young people attend four-year colleges. Numbers are even low compared to students with other disabilities, such as learning disabilities or speech-language issues. Colin is part of the first wave of students to participate in ASD Nest from kindergarten through high school. He benefited from a co-teaching model that had two teachers in the classroom, intensive behavioral support and extra help with social skills. He said that people did not begin to make sense to him until middle school. He struggled with behavioral outbursts, which are now rare. "I don't think very many students are being thrown in the hallway because they are stabbing themselves because of a schedule change," he says with candor and dose of humor. When he started the Nest program, it was only in its 2nd year, at one New York City school. Nearly 15 years later, it's grown to 39 schools, serving more than one thousand students. And there is now much more joy in Colin's school life. He participates in class discussions and has true friends. He's on track this year to graduate with an advanced diploma.